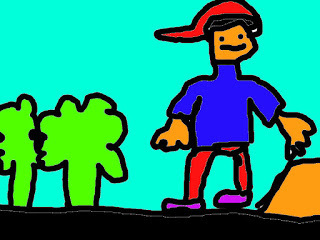 In the deep dark forest a boy named Jack was hunting for his lost dog named Rico.Jack bellowed, Rico! Rico! Rico! were are you.do you want to come get some pet food?But Jack hear nothing.Jack looked up in the sky and prayed for a miracle.then suddenly, he heard something.But it was just a tui.He felt sadder than ever but he was determined to never gave up. Jack saw the sun he ran until he fell down into the hole.Jack said help help help i am stuck please help me.Then jack heard something.Then John said i am coming to help you.Jhon said get my hand I will hold you because I got dog named rico.thank you because i lost him. Jack said now lets look for my home.Jhon said I think i found a house then jack said is it big then jhon said yes i will show you way. there it is.Jack said thank you for helping me. Hi Jacob! You are quite the aspiring writer! I am a teacher in Iowa which is in the center of the USA. My favorite subject to teach is writing and I love to see my students get excited about composing stories. Keep up the great work!